Dance Magazine is an influential American trade publication for dance published by the Macfadden Communications Group. It was first published in June 1927 as The American Dancer. William Como was its editor-in-chief from 1970 to his death in 1989. Wendy Perron became its editor-in-chief in 2004. Dance Magazine has multiple sister publications, including Pointe, Dance Spirit, Dance Teacher, Dance 212, and DanceU101. Dance Magazine was owned by Macfadden Communications Group from 2001 to 2016, when it was sold to Frederic M. Seegal, an investment banker with the Peter J. Solomon Company. Dance Magazine's "25 to Watch"
^ a b "INFLUENTIAL DANCE MAGAZINE EDITOR WILLIAM COMO, 63, DIES IN NEW YORK". Deseret News. Associated Press. January 8, 1989. Retrieved April 2, 2011. ^ Sims, Caitlin (January 1, 1999). 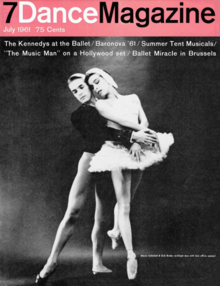 "NEWS of the Century - Dance Magazine's history - Brief Article". Dance Magazine. Retrieved September 21, 2012. ^ Van Gelder, Lawrence (February 24, 2004). "Arts Briefing". New York Times. Retrieved April 2, 2011. ^ Stahl, Jennifer (September 19, 2016). "Dance Magazine Announces New Ownership". dancemagazine. Retrieved December 5, 2017. Wikimedia Commons has media related to Dance Magazine.